Winter is coming and it is getting cold. If you are a real estate agency, this can also be a cold time for the phones as well. But there is always a need for homes. If your current WordPress real estate website is operating on all levels, managing the tougher times of the year is a cinch. If not, we have plenty to share to help set up your WordPress real estate website. Whether you are building a real estate website for the first time, have WordPress MLS integration questions, have an existing website, are a realtor, or want some tips and advice, there is information for everyone! What is my primary goal? More sales, more contacts, more page views on the site, etc. Write down the answers to these questions and start developing your Call-to-Action. Maybe it is a phone number at the top of your page or easy access to a contact form, or a better display of properties. Once you are ready, it is time to move to design. You should start the discussion of your WordPress real estate website with the structure and color of your website. There are a lot of templates and WordPress real estate themes out there, so make sure that the theme you are choosing is ready for selling property. Theme features you will be looking for — depending on your needs — will be a strong call to action at the top for a phone number or contact link, space for your logo or big text, special areas for property display, and featured property areas for prioritizing the properties you want to sell. Orange and Light Brown are vibrant colors for inviting people into your space. If your property is or properties are designed to be warm and inviting, these are good colors to pursue. Blue and Purple/Violet are awesome for building trust and dependability. For the same reason that many business use heavy blue, you want to be in a location where you can trust what is being told to you. Green is good for selling acreage and properties with an added outdoor element. When possible avoid colors like black or yellow, as they carry a dismal and cautionary tone, respectively. Have you ever looked at a supermarket flyer when you were hungry or watched television when you were bored? Visuals stimulate the sense and get people to take action. Your property photos should be the same way. Make sure the theme you are using has room for big visuals. If you have the budget for it, try to take good quality photos with a nice Digital SLR and bring them into a photo editor or use tools like ImageOptim to make the photos more suitable for web. If you can stretch the budget even further, get a wide angle lens for that camera to add some pop to your indoor property photos. Is the sale of multiple homes worth a one-time cost of a few thousand dollars? In addition, tap into the power of WordPress galleries to showcase loads of photos of a property in a nicely packaged space. To access WordPress galleries while editing the content of a property and home, go to “Add Media” and select “Create a new gallery” on the left. Upload or select the images for the gallery and create the gallery. You can order the photos or display them at random. Just like this long and helpful blog post, you wouldn’t still be reading if you didn’t find the information in the post somewhat useful. Make sure people are getting the information they desire. If a person is looking for information on a house, you don’t want them going elsewhere. If they are browsing properties, they want to know cost, number of bedrooms, number of bathrooms, square footage, etc. Make sure all basic information is easily accessible. Real estate themes typically have spaces to place information about a listing. The Internet is a place for searching. If a property has an MLS number (most do), then you could have a war on your hands with competitors. So how do you capitalize on the people walking into your digital storefront? Remember earlier when we referenced good Call-to-Action areas? Call-to-Actions and contact areas keep people glued to YOUR brand and stop them from going elsewhere. Ultimately, displaying product is important. But giving people an ask after they take a look is even more important. You can also consider solutions that tap directly into WordPress MLS IDX systems and interface with your website, but we have not found WordPress MLS IDX on WordPress that does not incur a monthly or large additional cost. How do you want to build your WordPress real estate website? If you are just getting started with real estate, let’s start with a good foundation for a real estate theme. The theme is called Modern Estate, and it is a free WordPress real estate theme that you can find more information on here. It is also available in the WordPress theme repository. You can download the free .zip file from one of the two sources and upload it to your website by going to Appearance > Themes > Add New > Upload. Select the zip file and upload it right from WordPress. Activate the theme. Now you are going to want to add your personal branding to the theme. To do this, you will want to navigate to the Appearance > Theme Options. There are a bunch of options here, but this is the spot where you will upload your logo (preferably a PNG with a translucent background) and choose your color scheme. From there, the Modern Estate Theme has tons of options to help set up your website to maximize Call-to-Actions. There is a lot you can do to customize the theme to look like your brand, so instead I have created a video reference — one which you can watch below. 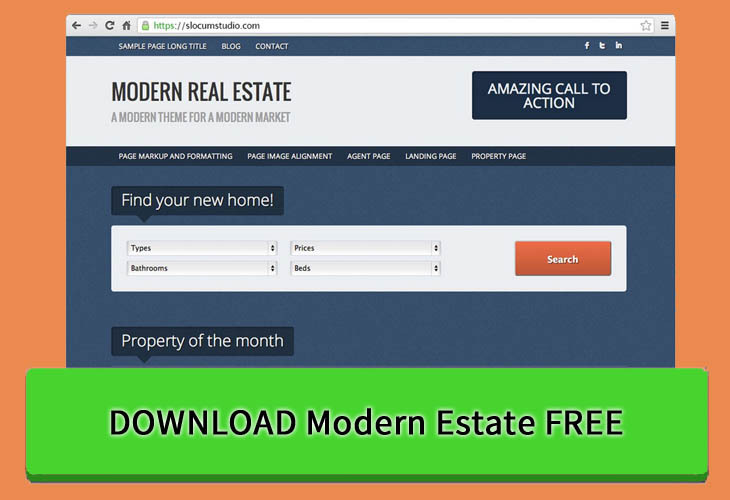 This shows you how to set up Modern Estate and Modern Estate Pro to sell properties online. Now we want to create a property. To go along with the free theme, we have also created a plugin that can be found on Github called Easy Real Estate. The plugin creates a new custom post type for properties to create properties and display them in a smart way on the website. It allows you to add important information about the property and eventually create searchable taxonomies for users. While the free version of Modern Estate gives you plenty of resources to get a good real estate website going, upgrading gives you more! With Modern Estate Pro, you get more color schemes, like a beige, a darker blue, a purple and a green to keep in line with the color psychology we talked about earlier. In addition, you can create custom colors using the WordPress customizer! It also comes packaged with the Easy Real Estate plugin to create agents, properties, and testimonials. Documentation is also available to help set up these different facets of the website. Find out more information about Modern Estate Pro here. Have an existing WordPress theme and want to create a better user experience? Using the Power User version of the new Conductor WordPress plugin allows you to choose how and where information about your property is displayed from popular free tools like Pods and Advanced Custom Fields. Check out how to take your current theme and display content the way that you would like with a video showcasing a display of custom fields. You can take the information from the video and apply it to fields like “Bedrooms” “Price” and “Square Feet”. With Conductor, you can showcase multiple properties on a page in the way YOU want to display content. With the Easy Real Estate plugin we discussed, you get to enter an MLS number with each property you are listing on the site. However, this number is entered manually, and manual information will have to be entered on the property. WordPress themes by default will not automate the display of MLS. The most frequent option we recommend to clients is IDX Broker, a WordPress MLS IDX solution that has a monthly recurring fee. IDX Broker is a separate tool outside of your website. The idea with IDX broker is to make the site look like your existing site with styling and colors to match, but displaying up to date MLS information. This will require knowledge of code but with the right team and attention to detail can be made to look like the rest of the site. Check out an example of IDX Broker in action with the R.P. Valois Real Estate website. You would be hard pressed to tell the difference between the IDX website and the actual R.P. Valois website! The best part is the service is automated to update the MLS, so the MLS listings are up to date. With all of these resources available, you should be well on your way to creating a solid real estate website using the power of WordPress and your imagination. If you need additional help with setting up your website or have more questions about MLS integration and the Modern Business Pro theme, please contact our team.